Some of the world's biggest heists, involving huge bundles of cash or stolen goods, could be solved by one of nature's smallest creatures. New research at the University of Reading has shown that items stolen by criminals and buried for safekeeping can be traced using mites living in soil, which provide clues to their specific location anywhere in the world. Scientists worked on a 2016 crime in Germany, where at least 500,000 euros were stolen and buried abroad. After police seized some banknotes from one of the criminals, mites attached to the notes were rescued, allowing the geographic location where the money was buried to be narrowed down to a region of Australasia where the mites originated. M. Alejandra Perotti, associate professor in Invertebrate Biology at the University of Reading and co-author of the report, said: "With this research we demonstrate that mites can be big players in investigations into high-profile crimes. This case highlights the importance of carefully identifying and preserving minute organisms found at crime scenes, something which until now has been overlooked by investigators or police. "We could be using these microscopical animals to recover cash, drugs or even corpses, which are often buried by criminal gangs to hide evidence or be retrieved later. This breakthrough was made possible by the work of a talented scientist who fully dedicate their research to unravel these mysteries." In the study, published in the journal Forensic Science International, the scientists outline how invertebrates in soil were used to pinpoint the hiding place of stolen property. They refer to other solved and unsolved cases where the technique could potentially have been used. In the German case, the perpetrator found carrying the stolen banknotes initially claimed that the money was buried in Spain. However, the scientists found the seized notes were covered in traces of a non-European, rare species of root or bulb mite. These are known to feed on seeds of palm trees and roots of trees native to a region of Australasia, which allowed detectives to narrow down their search to a specific area. The culprits later confessed they had buried the money in Thailand. Medjedline Hani, a final-year Ph.D. student in Dr. Perotti's lab, who conducted most of the research in the case, added: "Soil is often used in forensic analyses when pieces of evidence from a crime scene have been hidden under the ground or have come into contact with soil. However, the distinctive biological traits of organisms within the soil make them an untapped area that could offer vital clues." Banknote counting machines used to value the confiscated haul destroyed much of the fibres, minerals and mite evidence on the notes, but fortunately the soil expert at the Kriminaltechnisches Institut in Germany was able to isolate a few specimens. 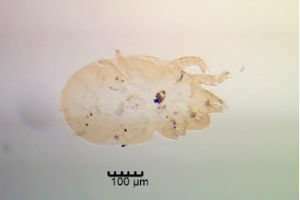 This was enough to allow the Reading scientists to study the mites, determine the species and consequently gather details of their geographic distribution, estimating the possible location of the buried money. What happens to stolen guns?